“The word Educare [Latin] means to bring out that which is within. Human Values are latent in every human being; one cannot acquire them from outside. They have to be elicited from within. Educare means to bring out human values. To 'bring out' means to translate them into action." The end of education is character, and character manifests itself as unity of thought, word, and deed. Educare recognizes that both worldly knowledge and knowledge of the inner self are essential to give value to human life. Therefore, this philosophy of education places emphasis not only on educational achievement but on character development. It stresses the importance of leading a moral life and of becoming aware of one’s innate nature. A key component of this philosophy is the assertion that there is one ultimate and universal truth, which may be expressed in a multitude of ways. The pursuit of truth requires discrimination, intuition, and introspection. Truth is timeless and changeless, and reveals the inner character and qualities of a human being. People, who act with truth, act with integrity; they think and live with love and peace, and their lives are filled with nonviolence, self-control, self-respect, and self satisfaction. Right conduct is ethical behaviour. The injunction, “do good, see good, and be good,” captures the essence and intent of this value. Right action is the practice of love in action. It encompasses the morality that underpins all societies. It is a set of principles that ensures stability and order in individual lives and in society as a whole. On a personal level, right action means those duties that are incumbent upon a person as a result of his or her social obligations, professional status, and stage of life. On a wider level, right action is based on an appreciation of the unity of mankind and the moral structure that guides societies. Ultimately, actions that are right spring from the promptings of the conscience. Peace is best described as inner mental calm, mental equipoise or equal-mindedness. It is the ability to maintain equanimity regardless of loss or gain, success or failure, pain or pleasure. Equanimity is achieved when a person is able to switch from outward vision to inward vision. To acquire peace, it is essential to quieten the mind and open the heart in order to experience the silence within. Peace is innate in all human beings; it is within each person simply waiting to be uncovered. Love is best expressed as an energy permeating all life. It is not an emotion, but is the foundation of human nature. It is totally unselfish and unconditional. The more it is shared, the more it grows. The happiness that can be derived from an open unselfish sharing of love is an elevating experience. Nonviolence means not harming anything living or non-living in any way, by thought, word, or deed. Nonviolence enables one to recognize the oneness of the life force that is present in all living beings. Nonviolence may be defined as "universal love". It fosters the understanding that human beings have an obligation towards every component part of this universe and that they should try to expand this love to all. 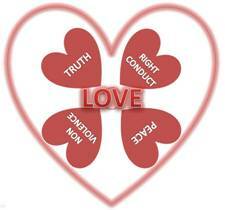 If one practices truth, right conduct, love and peace, one is nonviolent. Nonviolence is described as the zenith of human achievement and perfection and present when one recognizes the oneness and unity of all creation. “Nonviolence is the answer to the crucial political and moral questions of our time; the need for mankind to overcome oppression and violence without resorting to oppression and violence. Mankind must evolve for all human conflict a method which rejects revenge, aggression, and retaliation. The foundation of such a method is love.” -Martin Luther King Jr.
happiness? How can I achieve the highest good for myself and for the world? You teach love to students only through love. 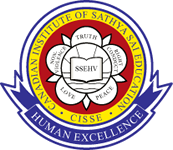 At the heart of the system of Sathya Sai Education is the teacher. Teachers are committed to living the values and to nurturing their development in the learner. The teacher teaches through love, and it is through love that transformation ultimately takes place. Since children learn through example, teachers act as role models through their good character and their practice of the human values. The teacher creates a learning environment and culture of love. A teacher who actively practises the human values becomes an instrument through which children become aware of and manifest their own inner values, which ultimately leads to the blossoming of their character. Teachers create a loving and nurturing environment in which every child feels respected and accepted. This is achieved by integrating values into all aspects of learning and instilling ideals such as trust, cooperation, and mutual respect in the students. The Direct Method seeks to instil values in a direct systematic way. It employs five teaching techniques, articulated below, that have been used for generations by great teachers. Based on human values, these five teaching techniques, when integrated with contemporary teaching strategies, connect with the body, mind, and spirit of the learner. The Indirect Method is based on the premise that every school subject has inherent values and that if these inherent values are taken into consideration when lessons are being planned, it is possible to draw out values during the course of one’s normal teaching. The teacher looks for teachable moments to bring out values in any particular subject being taught. This can take place anywhere, such as on field trips, through sports and other extra-curricular activities. Meditation allows children to sit quietly and tune in to their inner resources. It improves concentration and receptivity and increases memory and understanding. At a deeper level, it develops intuition, patience, and discipline and helps children experience the value of Peace. Increasingly schools are turning to meditation and other compatible techniques (mind fullness, visualization, breathing/relaxation, etc.) because scientific research shows that meditation makes people healthier, kinder and happier. Researchers have linked meditation with improved attention and concentration, reduced stress and emotional reactivity, impulse control, acts of empathy and altruistic love. Sharing quotations with children from great people from all cultures is inspiring and uplifting. Quotations help to develop memory, promote analytical thinking, establish truly human ideals and enable the children to relate to their highest potential and intrinsic value. Singing is a wonderful way for children and teachers to join together in fun and friendship while learning. Songs express the language of the heart; they remove barriers and promote peace and love. Music and group singing are the most powerful tools to put the human system in harmony and rhythm. When the children sing together, they experience a sense of unity. Singing also improves memory. Stories have been used throughout history to impart important messages by making linkages to real life situations and solutions. Stories generate interest, capture attention and leave the listener with something to think about and act upon. They help to expand the children’s sensibilities and feelings of compassion and are useful for cultivating spiritual understanding. Group activities are considered to be an essential component of student-centred learning. In Educare children not only work in groups but also learn how to grow as effective team members, how to use their own unique strengths and qualities for the good of the team, and to understand the notion of ‘strength in unity’. Some activities include: role-play, mime, drama, creative writing, art, games and service activities. The five teaching techniques engage all aspects of a child's personality and allow for holistic development. They correspond to the five domains of the human personality: physical, mental, emotional, social and spiritual. Self-transformation in children and adults is achieved through self-inquiry, self-reflection, and self-awareness. Self-inquiry means to ask oneself, “Who am I?” One learns to be mindful of one’s thoughts, words, and actions. A variety of service projects are undertaken to encourage students to understand selfless service to give to others without expecting anything in return. They are encouraged to participate in community service projects where they share with other members of community, such as seniors, the homeless, and the poor. Selfless service engenders compassion and teaches children to consider themselves as part of the human family. They learn the joy of helping others. They learn to expand their hearts and experience love.